"I am a collection of oddities, a circus of neurons and electrons: my heart is the ringmaster, my soul is the trapeze artist, and the world is my audience. It sounds strange because it is, and it is, because I am strange." Wow! To say I am suffering major book hangover after reading this one would be an understatement! 2015 has kicked off with a bang in the world of books; and Mosquitoland may take the cake! Over the last few months I was seeing this book pop up on all kinds of blogs and memes. One of the most anticipated books of 2015, and after reading it, I can totally understand why! I am not usually one that falls for the hype or that ends up liking it as much as everyone else does. As I've already mentioned though, that was clearly not the case for this book. I loved every second...Every page...Every word! I am totally fan-girl'ing over this book right now. My arc is tattered and worn. This book literally followed me everywhere! 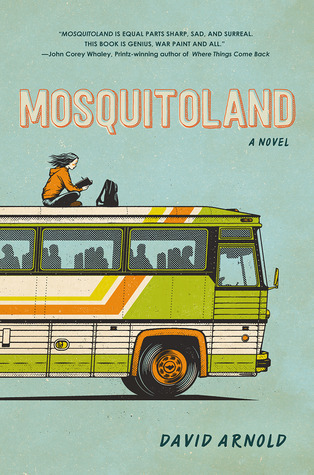 To the gym, the mall, the kitchen, friends houses...When it came to Mosquitoland the phrase: "I'd rather be reading." definitely marks true! Alright, alright! You're probably thinking: "Just get to it already!". What about Mosquitoland did I love so much? Well, everything. Ha! How do ya like that?! Go on and read it. You'll see exactly what I mean. First, you'll meet Mim(Mary Iris Malone). A character that has so many amazing, sarcastic qualities that I couldn't help but love her...And see a little of myself in her. There are also qualities about her that will have you wanting to embrace her. Shelter her from the cruelties of the world. Then you'll meet Arlene, Carl, Poncho man *shutters*, Ahab, Walt, 17C a.k.a Beck...And the rest is history! This amazing crew of characters(aside from Poncho man) will nest their way into your heart. You will want to prolong your reading experience just so you can spend as much time with this eclectic bunch o' folk. Mosquitoland also tackles Mental Illness. Something that I am grateful for. Mental Illness is slowly getting the attention it needs, and I think the more it comes up in Early Chapter Books and Young Adult books, the more people will learn that they are not alone, that they can relate and that they there is help out there. I've mentioned it before and I'll say it again: I LOVE novels that take me on a journey(pun intended) of self discovery. I love seeing not only the character go through their transition, but to also discover who they truly are in the process. As Mim mentions: Sometimes a thing is not a thing until you say it out loud. In case I did not make myself clear, this is a novel that you need to read. Allow yourself to fall victim to the hype when it comes to Mosquitoland. David Arnold has definitely put himself on my radar! If there is ever a standing ovation warranted for a book, this would be the one! The thesis writing is a hard task to write along with every rules and plans. Students may get tight fights to submit a best thesis for the campus. This writing must need good reading habits to get more points. The standard reason for the linked with there your position on the current issue. However a well starting of your paper is far beyond that. The thesis must to be a sensible in one sentence clearing up of your think. That leaves most likely in user’s mind about which side you are on from the earliest starting point of thesis. Taking after the thesis you have to give a smaller than likely outline. It reviews the cases you will use to boost your thesis in whatever remains of the thesis. Not just does this advice per user what's in store in the ways to come yet. It likewise gives them a deep knowing of what the thesis speaks the truth. At last planning the last verdict is along these lines. It has the included lead of every time moving per user to the first section of the paper's body. Along these lines we can see that the basic link does not need with be especially more than three or four sentences long. For the first body you must to use your most grounded debate or most critical case unless some other more clear starting point is needed. The main verdict of this passage have to be the subject sentence of the section that specially spots with the cases traced in the scaled down diagram of basic paragraph. For a great writing help you can have this best essay writing service from the internet. In unkindness of the fact that the conclusion comes toward the end of your thesis it ought not to be seen as an early idea. I like reading books but don’t sure about writing. Just don’t like that process. You should be focused and pay attention to all the details. If I have to write a text, I would rather order it somewhere. I wouldn’t do it just by my strength. I would let professionals do their job. For example, that 6 Social Media Marketing Tools for Creating Better Content is very reliable, don’t you think? I am sure, here there are guys who have used it. Fast, easy and better than anything.